January falls on rough times. With the end of the holidays and the start of school, we need something to combat that beginning-of-year slump. When I’m down, I somehow always find myself in the kitchen, oven mitt in one hand and rubber spatula in the other. Baking, it seems, never fails to bring back some of that holiday joy. At times like these, nothing says comfort better than a platter of cookies waiting to be shared. At your next party or potluck, step up your cookie platter a notch with a tiered cookie buffet featuring various species of cookies. 1. The Sliced Cookie. Sliced cookies such as icebox cookies and biscotti are ideal vehicles for your favorite mix-ins. Cara and Pheobe’s Espresso Biscotti feature chocolate chips in an espresso-laced cookie base, while these Cinnamon Mocha Dolce de Leche Bites incorporate crunchy caramel-ly Heath Bar bits into the dough. These Whole Wheat Pistachio icebox cookies taste especially yummy if you can get your hands on one of those large blocks of white chocolate to cut or grate by hand into uneven shards. The big shards provide chunks of sweetness while the tiny slivers meld into the dough and infuse it with milky, creamy, White Chocolate Goodness. 2. The Sandwich Cookie. 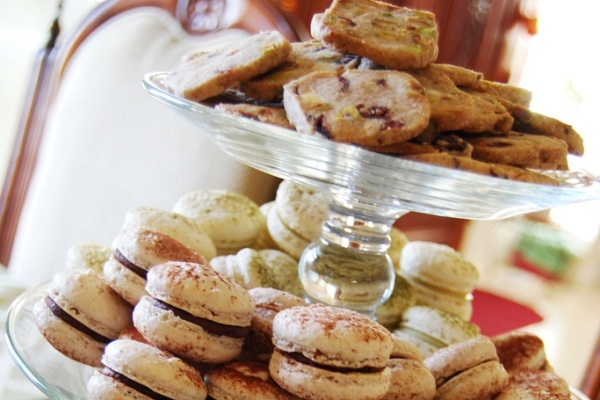 Linzer cookies, alfajores, macarons…sandwich cookies add sophisticated flair to any cookie platter. 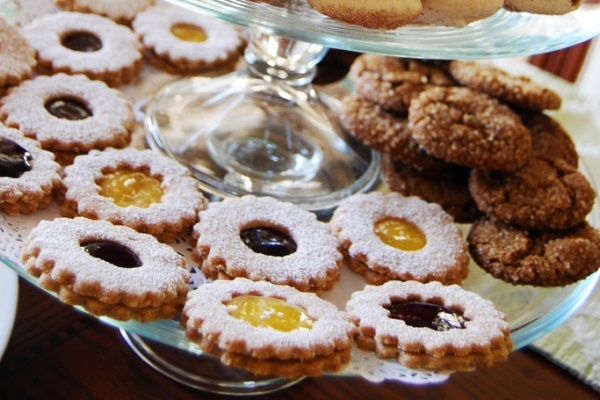 Linzer cookies can easily add color to any plate; pick two or three of your favorite fruit preserves to use as the filling. The leftover dough can be used to make linzertart. 3. The Scooped Cookie. Scooped cookies are the ultimate crowd-pleasers: humble yet delicious, simple yet versatile, and oh-so-easy to make. Mix-ins can be tailored to your taste (or just toss in whatever odds and ends you dig up from the pantry). Cara’s Cowboy Cookies, which feature chocolate chips, pretzels, and oats, and her Milk Chocolate Cookies with Ginger and Toffee are great examples of scooped cookies with festive mix-ins. Ginger is such a neat flavor that really shouldn’t be confined to the holiday season; this gingersnaps recipe is spicy, sweet, chewy, and all-around deliciously comforting.